I’m not a wine connoisseur…. I like wine, but I know nothing about it. I have tasted expensive red wines, but realised it wasn’t really worth it, at least if I would have to pay myself… So what I sometimes go for, is the label. Within a price range, of course… If I don’t know what to buy, I choose a really nice label. But this is not about wine, it’s about books! Very often I go looking for a specific novel or a specific author. Sometimes I buy one by chance. And what initially attracts me is very often the book cover. Then I turn around the book and read about it. 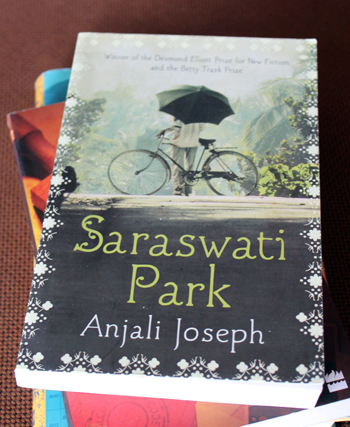 I can’t remember where I found Saraswati Park by Anjali Joseph, but I guess I fell for the bicycle, the flourish around the edges, the font and the green shades. The bicycle made me curious… although I didn’t expect the novel to tell a story about bicycles. What it does tell, is the story about Mohan; a letter writer in Bombay. A dying phenomenon. 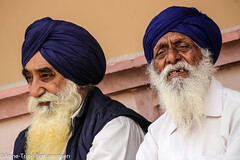 Never the less, when I visited Bombay last November a guide took me to the remaining letter writers outside the General Post Office in the south of Bombay. I felt lucky… I was able to see something that represents – soon – another time. In short; the letter writers have for decades written letters on behalf of those – migrants for example – who are not able to write themselves. Or, they fill in forms and help sending parcels. These days, even the underprivileged have access to a cell phone, and thus the letter writers are on decline. 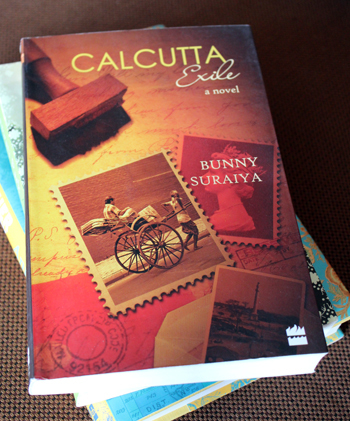 Calcutta Exile by Bunny Suraiya is definitely novel I bought because of the book cover, and also because I’d like to go to Calcutta – where I haven’t been yet. This might not be great literature and a book to remember, but it tells the story about Anglo-Indians and in that respect depicts a part of Indian history. Calcutta’s Anglo-Indians, one of the most graceful and beautiful communities of India, became bewildered orphans, suddenly uncertain of their roots and equivocal about their future. A book cover that says… travel back in time. Anosh Irani was new to me before I read about him in a magazine recently. 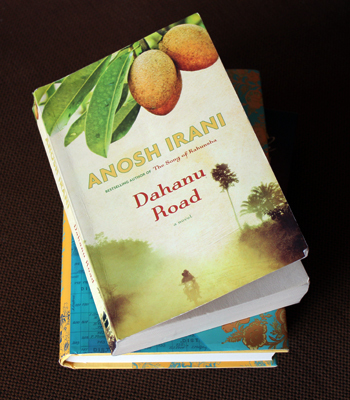 Dahanu Road is his most recent novel. Literature never fails to enlighten me. I have now learnt that there are Parsis and there are Iranis… but that is another story. On the front cover you can see the chikoo fruit; not only does it look good but it plays an important role in the novel. Dahanu Road is one of these books permeated by domestic violence and whether the end is optimistic or pessimistic I really don’t know… It was, at times, a struggle to read. Shapur Irani always thought of dusk as a beggar. It had no light, it had no darkness; it lived on the scraps that were fed to it by day and night. 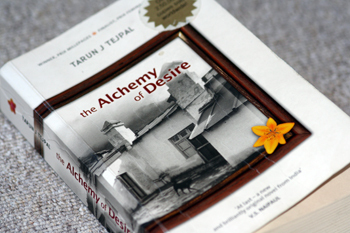 The Alchemy of Desire brought me to Uttaranchal in the north of India where I met Tarun Tejpal, his father and his wife. Which is yet another story…. I read the novel and knew I just had to go there. The front cover shows a photo of a house which the story evolves around. This house is now turned into Two Chimneys, a bed and breakfast where we were the very first guests a few years back. I never really thought the house in the book was for real, and I took the cover photo to be nothing but an illustration. But it was all very much real… The house on the hill with the two chimneys… Literature can open doors! A book and a house….